Remember the very first time you saw an image of the Stealth Bomber? With it's aggressive lines and matte black paint job? Well the Guardian Back-Up probably belongs on board that bird. Because the overall look and attitude is much the same. 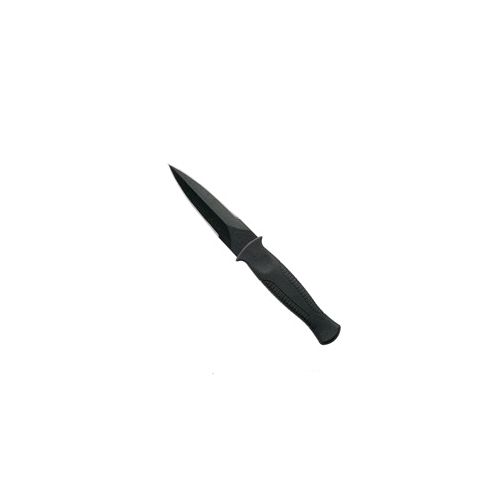 This is a professional fixed blade knife that takes a mighty serious cut at self defense. It features blackened—and therefore non-reflective—stainless steel in a 3/4" tang blade. It's lightweight. It's compact. It's effortless to carry, and agile to use. Importantly, the Santoprene®-covered nylon handle is very much at home in the hand of those who take on life's nastier tasks. Don't overlook the patented sheath. It lets you adjust the withdraw tension to suit your individual style. Clip it to your boot or belt or your strap, and you'll never be without a reliable back-up.